Oh, what fun I’m going to have with this week’s blog! I get to try out some new quilting tools and show you how to use them and all the advantages they offer. Thank you to Sew Easy® and UNIQUE for supplying the quilting tools and notions to make this project. When I was asked to blog this week I was also asked to incorporate a Valentine theme. The challenge was on! So, I came up with a small, easy Valentine wall hanging project for which you’ll either learn a new skill or practice one that you may not have used in a while. The wall hanging once completed will measure 17″ x 17″. I don’t know about you, but I have a tendency to get more fabrics than needed for a project so I’ll use fabrics that I have remaining from another project. For that reason I’ll be using up fabrics from the Stonehenge Gradations Brights collection by Northcott. 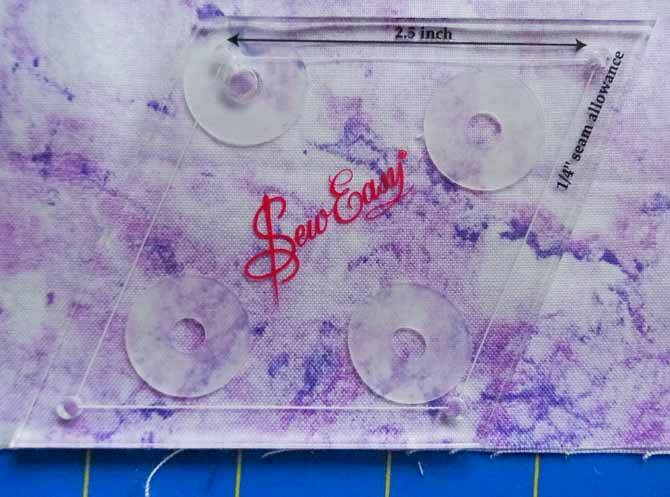 I’ll also be using the SewEasy® Diamond Template Set for the wall hanging. The reason I love these templates, and you’ll too, is that there’s a ¼” guideline on all 4 sides of each template. These lines will definitely work to your advantage should you ever need to fussy cut fabrics. Come back to see this Friday’s blog post and I’ll show you how! A suggestion! 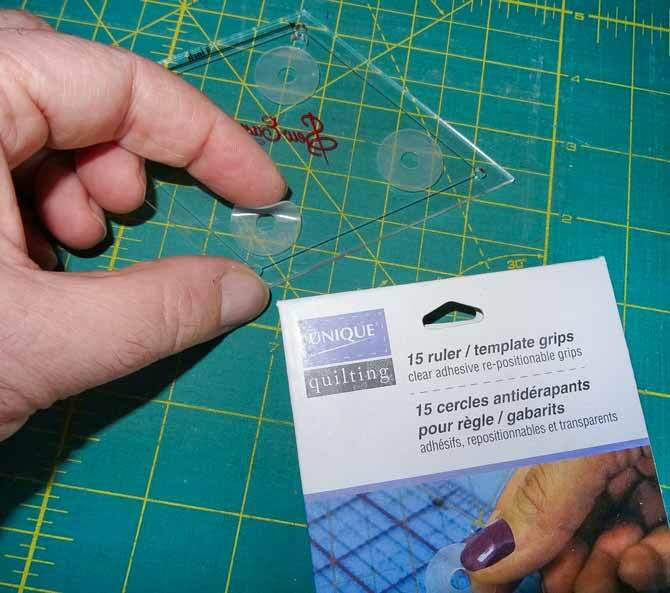 Before you use these templates or any ruler that slides around on your fabric I suggest that you attach UNIQUE ruler/template Grips to the underside of your templates. This will greatly reduce template slippage on the fabric. 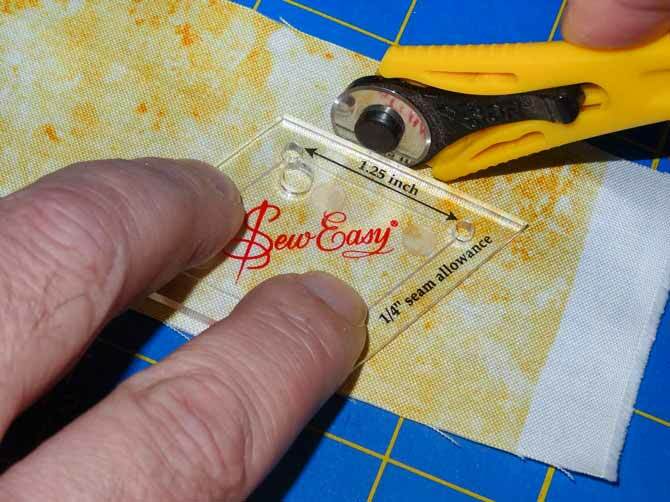 Applying UNIQUE ruler template grips to the bottom of an Easy Sew template. Place the 2½” template over your fabric you wish to cut. For this project darker reds and assortment of lighter contrasting fabrics. Using a medium size rotary cutter such as a 45mm or a 60mm is usually fine, but when I need to cut fabric using a smaller ruler or template I prefer to use the 18mm KOMFORT KUT™ Rotary Cutter. 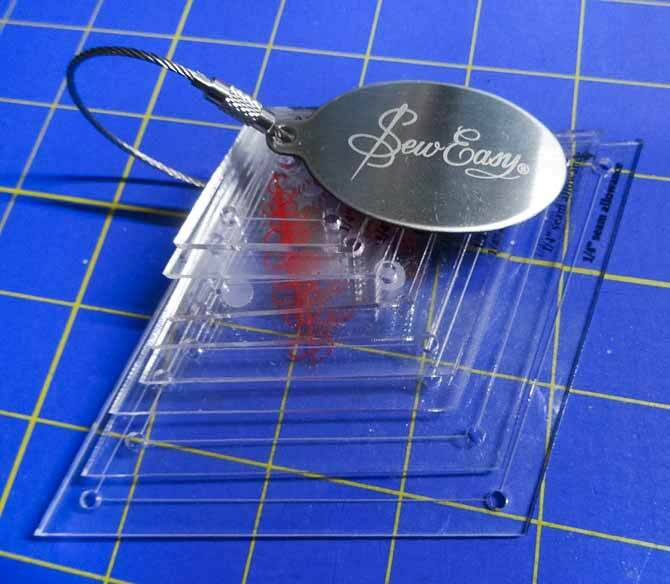 Using a 18mm rotary cutter will allow you to better stop cutting at the template’s corners without going too far beyond. I also find it useful to use a smaller rotary cutter when the space is limited due to the size of the template. Use the 18mm KOMFORT KUT™ Rotary Cutter for cutting of fabric using small template. For this project you’ll need to cut 22 red diamonds for the heart and outer edge and 27 diamonds of different colors to complete the wall hanging: 49 diamonds in total. Tomorrow, we’ll begin sewing and discovering more fun quilting tools! I love working with templates, at times. It’s great when I need to concentrate and quiet my mind.